The ALT SP50 system has been designed for fabrication of exterior sun protective constructions. The use of exterior sun-protection systems is the simplest and the most effective method for passive cooling of building’s interior space. Owing to the bar constructions the majority of sunbeams stop before penetrating into a room. 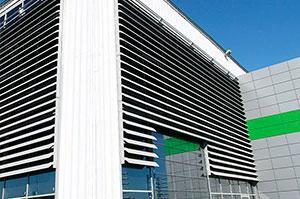 The space between facade and sun protection bars provides air circulation (ventilation). The ALT SP50 system is vertically and horizontally equipped with fixed bar fastenings within covering brackets or on guide rails. Depending on construction upload designer has the possibility to choose essential bracket type: universal or reinforced. Construction assembling and mounting are simplified to the maximum, profile treatment operations are minimized. Bars dimensions are available from 100 mm to 280 mm with a range of polymeric or anodic coating which permits architects and designers to be able not just to engineer an exterior sun-protection construction, but also to form a unique view and additional volume for a building.